Tuesday 4th June. 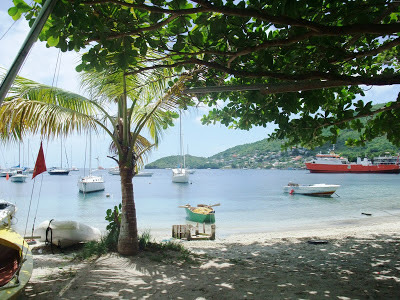 We are off to Marigot bay, a gentle sail of 9 miles, full of water, petrol (Gasoline) and Diesel we are ready for anything! On arriving at Marigot we are met by the usual fruit sellers, and guys trying to sell you a mooring ball at an extortionate price. These moorings are not licenced or sanctioned by the harbour authority and are not usually well maintained so use them at your own risk! We politely decline the mooring ball offer and anchor on the North side of the outer harbour under the watchful eye of a fresh fruit vendor. We are in front of ‘Vivace’ and can see ‘Impressionist’ coming in behind us. We get away with a ‘deal’ from the fruit seller; we now have enough fruit to cross an ocean. The quality is usually excellent and we have Star fruit, Mangoes and Bananas. You cannot help but feel sorry for these guys as the season is almost over and the next few months they will have good fruit but few customers. Sun downers at the beach rum shack is as pretty as ever, there is only the one bar open (there were 4 earlier in the season). It is an overcast evening and even the locals are staying at home. The shops in the marina village are mainly closed and we have supper at Mygo’s on the waterfront with ‘Impressionist’ and ‘Vivace’. One night here is enough; we will clear customs tomorrow and overnight at Soufriere before heading for Bequia. 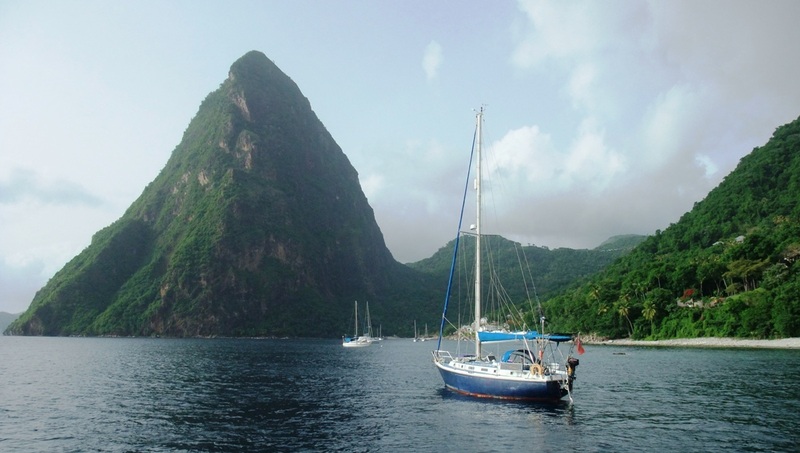 A note to anyone following in our wake, don’t tell customs you are going to the Pitons they will charge you a mooring permit fee. Just say you are going to Soufriere. The mooring permit system has been abolished but the customs guys are still implementing it, just pay the mooring fee to the park rangers at the Pitons or Soufriere. The mooring between the Pitons is spectacular, the wind and current makes the yachts lie at odd angles to each other. 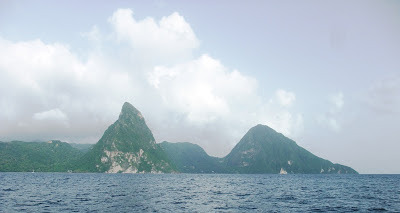 We have cows grazing in the hillside and a beautiful backdrop of the impressive Pitons and at dusk the bats from Bat Cave come out and fly around us, hopefully eating any mosquitos venturing off shore. Up at 05.00, we are sailing south, there is a small flotilla doing the same, ‘Impressionist’, ‘Vivace’, ourselves and ‘Panache’ a large catamaran. We set off with a reef in the main but are motoring as there is very little wind in the lee of the island. Eventually the wind manages to pick up and we set full sail. 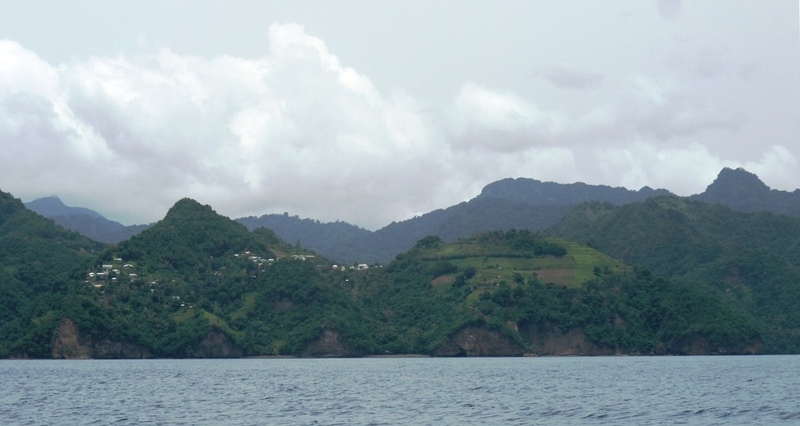 We can see St Vincent to the south but we need to head slightly west to get out of the foul current round the bottom of St Lucia, we will pick up our easting later as the wind is ENE and will give us a fast reach. The forecast 20kt winds have not arrived and we have probably the best sail in between the islands so far, 15Kts and 1-2m seas, we are sailing nicely at 5-6kts. The NW coast of St Vincent produces a few gusts of 24kts, (a good test for our new autopilot). The new pilot steers the boat well on coastal passages that would have our Hydrovane sailing us all over the place. We decided not to stop in St. Vincent as we are still getting mixed reports on theft and serious hassle from "Boat Boys". 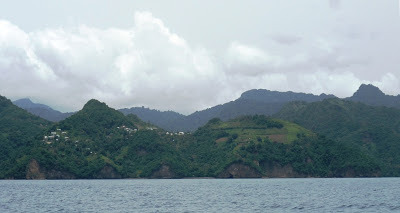 It is a pity as the island is very scenic with many really pretty anchorages. We hope next year things will have settled down so that we can visit. On the leeward side of the island we lose the wind and have to motor for a couple of hours, the wind will soon come and it does! The gap between St Vincent and Bequia is noted for its windy and rough conditions. Today conditions are fairly benign but it is easy to see how things could get rough with wind against the current. 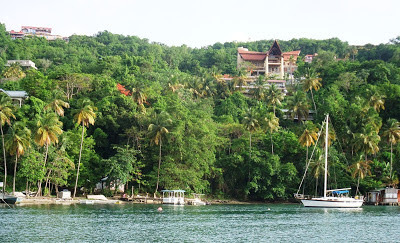 We head for the north of Bequia and watch the current take us towards our destination of Port Elizabeth and the anchorage of Admiralty bay. 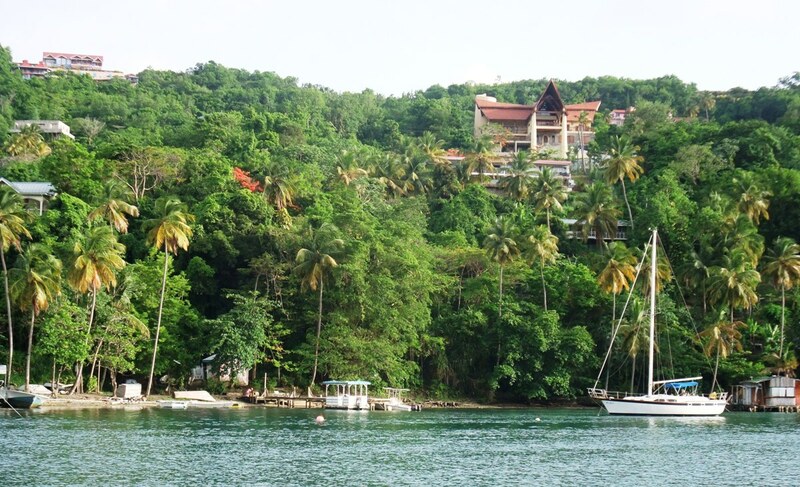 We anchor off Princess Margaret Beach, a beautiful spot. A quick swim in crystal clear water. Juvenile angel fish among others underneath the boat. Customs and Immigration will wait until tomorrow morning. Yes-The sunset really was this colour!